We stock everything you need for your reloading bench. With our special order service, we can order most hard to find reloading supplies; usually in less than one week! Johnson's is an RCBS Pro Center dealer. Mayville (MEC) We stock a full line of presses and accessories! We offer a wide range of products from Dillon. We also carry presses and supplies from Redding, Lee and Lyman. We stock Remington brass. We can order Starline brass for many hard to find calibers. Dirty or discolored brass? We carry case cleaning products from Hornady, Dillon, Frankford Arsenal, and Lyman. Need bullets? 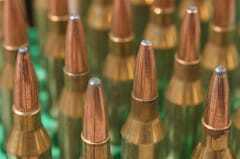 We stock Speer, Hornady, Sierra, Precision Cast, Barnes and Nosler. Need powder? You'll find Hodgdon, Alliant, IMR, Accurate Arms, and Winchester on our shelves every day. Primers? How about Federal, CCI, Winchester, and Remington? Once you get your ammunition loaded, you'll need storage boxes from MTM and a Chronograph from Shooting Chrony. For FREE information on reloading how-to, contact the National Reloading Manufacturers Association.